Home | Roofing Information | Metal Roof: Battens or No Battens for Installation? 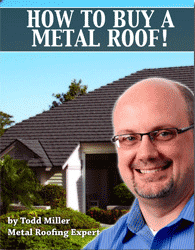 Q: Can a metal roof be installed over my existing shingles without the use of battens? This great question comes from Edward C., a homeowner who plans to have a new metal roof installed over the aging, existing shingles on his single story home. Thanks, Edward, for allowing me to share our correspondence on this frequently asked question. A: There are several things to consider when determining whether, or not, to have your new metal roof installed over battens. By design, some metal roofs MUST be installed over battens, some MUST NEVER be installed over battens, and some can be installed over battens OR solid decking. So, whichever way you go, it’s important to choose the right product and install it per manufacturer specifications. Next, I highly advise the use of a layer of underlayment over the old shingles or decking, whether or not battens are used. I interpret the International Building Code as requiring it and it’s just a good practice. I normally suggest a layer of one of the higher quality synthetic underlayments, and an ice and watershield if required by code. Now, your existing shingles are pretty curled. You could install a textured metal roof such as a metal shingle, shake, or tile over these curled shingles (with underlayment). You also could install a corrugated through‐fastened product and probably not have issues. However, a true standing seam, especially one without any sort of striations or stiffening beads in the center of the panels, will probably show oil canning as the result of going over shingles like yours. As to the potential benefit of battens: they do create a thermal break to help minimize heat transfer from the metal to the roof deck. That is a good thing. However, if you choose a metal roof that is either light in color, or has reflective pigment in the paint, that will be very helpful as well. Your attic ventilation and insulation will also help with summer energy efficiency. One effective way to use battens is to cross batten. This involves putting down vertical battens first, attaching them through the roof deck to the rafters. And then you put down horizontal battens for the roof panel attachment. The resulting vertically oriented chambers can then be ventilated by bringing fresh air in at the boom and exhausting it out at the top. This has very positive results as far as keeping heat out of the attic. It can also help avoid roof top ice dams in the winter. However, cross battening significantly raises the roof level. This means gutters will have to be re‐hung. It also could cause the roof to interfere with skylights, clerestory windows, dormers, and even chimneys and plumbing stacks. And, again, if you have good attic ventilation and insulation, that is very helpful and can be more than adequate in many cases. My own roof is direct to deck, for example. I also need to point out that metal shingles, shakes, and tiles usually have an integral airspace between the metal and the roof deck. That creates a thermal break which is very similar to a vertically seamed metal roof installed on horizontal battens. The dead airspace in the hollow beneath these panels acts like the dead airspace between two panels of glass in a thermal pane window. Finally, if a structure has very limited insulation and ventilation (especially ventilation) in the attic, battens can be very helpful. Again, this is from a thermal break / thermal bridging standpoint. A home with limited attic ventilation is at HIGH risk that moisture originating inside the living space can migrate to the attic and cause condensation there. If that moisture hits a cool surface, it will condense. Condensation will lead to mold, etc. This is not good. While your home may have been fine with asphalt shingles and no ventilation, the addition of a metal roof will reduce the roof deck temperature even just a slight bit.That can be enough to be the straw that breaks the camel’s back, and cause condensation in the attic that did not exist before. Additionally, I want to point out … if you do things to your home like tighter windows, house wrap and siding … those things reduce the ability for moisture inside the home to exit through the walls. This can cause higher moisture levels in the attic. So, if you plan those improvements now, do not do something to the roof that could make it more prone to condensation when those other things are done. I hope that you find Edward’s question and my answer helpful. Here’s a fresh video on metal roof battens, from our Metal Roofing 101 series. And of course, you can ask additional questions right here. Thanks, so much, for reading. Thank you for this blog post. So, am I reading this correctly that you installed the metal roofing to your own house without battens? I am working with a home inspector that is telling homeowners that if metal roofing is installed directly to asphalt shingle then there will be condensation on the underside of the roof deck. i feel that if there is poor attic ventilation AND moisture from the home being introduced to the attic, there could be condensation on the roof with any roofing type. Would you agree? You are correct on how my roof was installed. If there was no condensation in the attic prior to the metal roof, very rarely will there be after a metal roof. The condensation results when warm moist air inside the home hits the back side of the cool roof deck. A metal roof will drop the roof deck temp a little bit and can sometimes be the straw that breaks the camel’s back and cases condensation that was not there before. That is very unusual though. However, isn most homes, attic insulation and ventilation prevents this from happening. A vapor barrier behind the ceilings is also helpful.